British coinage has a unique history dating back to the second century AD when coins were used in trading by Celtic tribes of Britain and Gaul. British coinage became far more regulated after the introduction of the coinage act in 1816 and the standardisation of the pound’s value in terms of gold and silver. In this article, we’ll look at 12 of the most valuable and rare British coins that you’d really wish were in your portfolio. This rare coin is also known as the double leopard since the coin depicts two leopard heads on either side of the king. Edward III acceded to the throne of England in 1327. Before him, his father Edward II had tried to subjugate the Scots and failed. Therefore, Edward took it upon himself to become a powerful and fearsome ruler to unify the kingdom. He also believed that England could prosper from being a prominent military force in Europe at the time and this coin was his attempt to create a currency that would be used across the continent, bringing much trade across the shores. The 1344 Florin was a coin with great design and appearance, but it failed as it had less gold and was not accepted by the merchants of the time. Today there are only three known coins in existence and in July 2006, it fetched £460,000 at an auction. It is therefore considered to be an extremely rare and valuable British coin. It can be seen on display at the British Museum. One of the rarest of rare coins of British origin, the coin is a 3-pound piece, which was the highest denomination minted during the hammered coinage era. The coin was introduced during the English civil war and shows the King with a sword, as well as an olive branch. The image is interpreted as the King’s prayer for peace alongside his preparedness for battle. A 1643 triple unite coin was sold for £105,000 in 2016. At the time of the accession of King Charles II to the throne of England in 1660, the need of the hour was to replace the existing coinage of Oliver Cromwell. A new design was thus created by Thomas Simon, medallist for the King. He made a petition for a new design and presented it to the King. Although the coin was never introduced, it is heralded as one of the finest examples of coin engravings ever made. One of these coins was auctioned in 2007 for £207,000. Queen Anne took over as the British monarch in 1703 at a time when the Empire was on the path of conquest across the world and her navy ruled the high seas. With a new Monarch in place and Britannia ruling the waves, a new coinage was required. However, at the time the country, in the process of financing global wars, was severely lacking in finance. There was a shortage of gold. The Royal Mint used gold which was captured from the Spanish galleons at the battle of Vigo Bay and minted a 5 guinea coin to commemorate the British victory. Today, there are less than 15 such coins in existence out of the original 20 minted at the time. The coin fetched £296,160 at an auction in 2012 and recently sold for £225,000 in 2016. Queen Anne, who ruled between 1702 and 1714 was the ruling Monarch when the union of England and Scotland happened in 1707 to form Great Britain. The 1706 coin was a new coin minted at the time to reflect the power of the new state. This 5 guinea piece is today considered to be a historic coin of considerable value. It was recently valued at £30,000 at an auction in Baldwin’s. During August to November 1819, the Royal Mint struck only 3,574 King George III 1819 sovereigns, produced in five batches. Interestingly, for reasons unknown, the gold used to mint the sovereigns were not procured from the Bank of England, as per standard procedure. This gold came from private financiers – mainly companies based in the city of London at the time. Since only a few were produced, the coins became rare within the next two years. It is believed that by 1821, only two such coins remained. Today, there are just 10 in existence, making it one of the rarest and one of the finest British milled sovereigns around. In May 2013, when the Bentley collection was auctioned, one of these coins fetched £186,000. These unique Queen Victoria 5 pound coins feature the motif of ‘Una and the lion’ on the reverse and are considered to be one of the finest British coins in existence. The coins are from the Queen’s coronation set. At an auction in 2014, one of these 1839 coins commanded a price of AU$141,000. The auctioneer Baldwin’s of St. James recently set a record new high price for this coin when it sold for £340,000. This gold sovereign was released at the time of the First World War and very few were produced. It had a value of one pound sterling and was in circulation prior to 1932. When the gold standard was lifted, this coin was phased out and due to its limited production numbers at the time, it has become a rarity today. It is valued at approximately £15,000. so the mint decided not to strike any more. However, the tradition at the time demanded that new pennies should be placed under the foundation stones of new buildings. Due to this reason, the Royal Mint struck around 6 to 7 new coins, some of which ended up under new buildings and the others in the Mint’s collection. The rarity of this coin, therefore, stems from the limited numbers that were produced. These coins were never intended for circulation and today, it is considered to be one of the rarest British coins around, with an approximate value of £72,000. The coin is extremely rare as only a few were made by the Royal Mint as a new experimental design. However, before they could go into circulation, the King abdicated the throne to marry American commoner Wallis Simpson. As a result, it is believed that only around 10 were ever struck. The coin is a 12 sided coin with an image of a thrift plant on the reverse. They are highly valued today due to their rarity and auctioneers have set the price at around £30,000. The UK changed its currency system and moved to the decimal system in 1971. After the shift, all 2p coins has the inscription ‘New Pence’ on the reverse of each coin. This practice continued for the next ten years, after which the Royal Mint decided that it was unnecessary to continue the practice any longer. Therefore, in 1982 the words ‘New Pence’ were replaced with ‘Two Pence’. Interestingly, the Royal Mint erroneously produced a limited number of 2p coins in 1983 that had the old inscription. Needless to say, this error created a limited edition rarity and the coins found their way into the hands of collectors. Each of these coins could well be worth £650 today. The Royal Mint released coins with 29 different designs in order to commemorate the 2012 London Olympiad. As some were released in smaller numbers, they have become rare and command a good price from collectors. One of the rare ones is the original aquatic coin which depicts water passing over the swimmer’s face. Only 600 of this design was ever released. An original coin like this could fetch up to £3,000 according to prices on eBay. 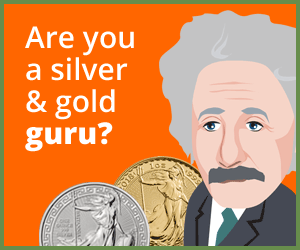 At Physical Gold, our team of numismatic experts can give you invaluable guidance on all kinds of valuable coins. The team has several man-years of experience and are constantly involved in research to ensure that we can guide coin enthusiasts just like you. Take a look at our website to see some of the great British coins we have on sale. All our products come with a genuineness certificate and a buyback guarantee. Call our team on 020 7060 9992 or drop us a line to find out more about how we can serve you better.